Do moving companies move cross country? Suburban Solutions sure does! Whether you are experiencing a corporate relocation or just looking for a change in scenery we have the long-distance moving solution for you. Our goal at Suburban Solutions is to make the moving process as stress free and pleasant as possible. We start with our easy to complete online job request form and follow up with an in home site visit to ensure we understand the full scope of the job and have matched crew and truck size appropriately. We offer straightforward, transparent, all inclusive Flat Fee pricing that will never change as long as your move details do not change. We pride ourselves on our estimate accuracy and not having any hidden fees. We can move you and your family from Coast to Coast or anywhere in between in as little as five days. With our guaranteed pick up and delivery dates the days of waiting 2 weeks for your belongings to arrive is over! Suburban Solutions is able to accomplish this by offering dedicated long distance moving services. We believe the concept of matching one client with one truck makes for the most efficient and best long distance moving experience. Your items will be the only items on our truck at a given time, once we load up your current home, your precious cargo will never leave that truck until we are at your final destination. We will never off load into a warehouse or transfer items to a larger vehicle, this eliminates the potential for anything being lost in the shuffle! The local move leader that is assigned to your move will be with you from start to finish. Once the truck is loaded up he will start the journey to your new home, this helps ensure we arrive on time every time. Most importantly our dedicated moving services provide you with a level of customer service that you will not see with other companies. We can easily tell you the whereabouts of your truck at any point in time! Moving Cross Country and Need to Ship a Vehicle? If you own a vehicle but would prefer to fly to your final destination Suburban Solutions can help coordinate the pick up and delivery of your vehicle along with your long distance move. We work closely with a licensed, bonded and insured 3rd party auto-shipping company that can deliver nationwide. Typically there is a 1-2 day window for pick-up and drop of with this service but we will communicate with you up until move day to keep you informed. Renting a UHAUL or a POD for your long distance move? 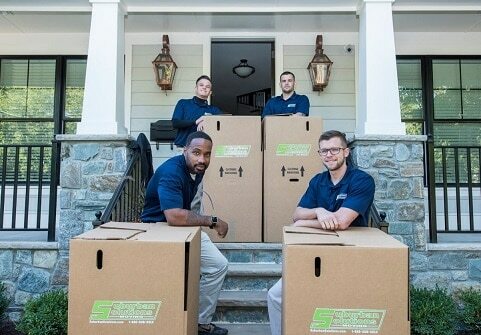 Our local moving teams are available to assist you with wrapping furniture and packing your truck for your upcoming move. Our movers are experts in loading trucks in an efficient manner which helps prevent damages during transport. We hope this helps! For a free long distance move estimate please feel free to reach out to us at any time or request a quote online!